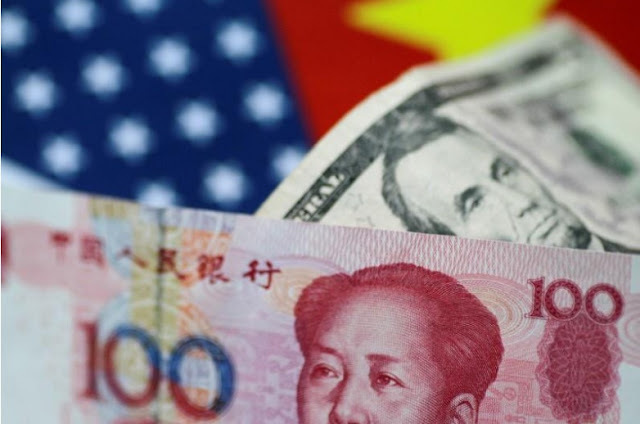 U.S. Dollar and China Yuan notes are seen in this picture illustration. LONDON - Worldwide debt has risen to a record $226 trillion - more than three times global annual economic output - and firms in more countries are struggling to service loans, a study shows, just as key central banks prepare to end super-cheap credit policies. World markets are expected to get confirmation over the next week that normalizing global interest rates from the extraordinarily low levels introduced to offset the fallout of the 2009 credit crash is no longer just a U.S. phenomena. The European Central Bank will lay out cuts to its 2-1/2 year-old stimulus program on Thursday, the Bank of England looks set to raise British interest rates for the first time in a decade, while the Fed is moving towards its third hike of the year. Years of cheap central bank cash has pushed world stock markets to successive record highs. But another side effect has been explosive credit growth as households, companies and governments took advantage of rock-bottom borrowing costs. Global debt now amounts to 324 percent of the world’s annual economic output, the Institute of International Finance (IIF) said in a report on Wednesday. One of the most authoritative trackers of global capital flows, the IIF report also highlighted “rollover” risks, especially in emerging markets that have borrowed in hard currencies such as euros and dollars. It calculated around $1.7 trillion needs to be refinanced or paid back before the end of 2018 across developing economies. Such debts will become costlier to service if Western interest rates rise and currencies strengthen. While U.S. interest rates have already been raised four times, the prospect of more alongside Europe’s shift toward tighter monetary policy, have pushed two-year U.S. borrowing costs to a nine-year highs. The IIF said the rise in indebtedness was largely down to a $3 trillion rise in debt levels across the developing world, which now have debt totaling $59 trillion. China accounted for $2 trillion of this rise, with its debt now at around $35 trillion. More broadly, corporate debt and household debt rose $2.6 trillion and $2 trillion respectively globally. “As Federal Reserve tightening continues, (debt) rollover risk is high,” the IIF said. The report acknowledged that some advanced economies had continued attempts to deleverage by trimming public debt and that the pace of global debt growth had moderated slightly. But it is in the corporate and emerging world that stresses are most likely to emerge, the IIF noted. First, the rate of China’s debt buildup - corporate debt jumped $660 billion there last year - had been much faster and steeper than in the United States in the run-up to the 2008 financial crisis or in Japan ahead of the 1991 banking crisis. Emerging market U.S. dollar or other ‘hard’ currency FX-denominated debt also now tops $8.2 trillion, accounting for nearly 15 percent of all debt across developing economies. Second, more firms are having trouble with debt servicing. Interest coverage ratios (ICR) suggests that the share of “stressed” firms is now well above 2010 levels. Across seven big emerging markets sampled by the IIF, stressed firms account for more than 20 percent of corporate assets in Brazil, India and Turkey, and nearly 15 percent of corporate assets in China. Across more developed countries, the deterioration in ICR ratios has also been notable in Canada, Germany and France, while in contrast, firms in Japan and the UK have seen a marked improvement. “Even with low global rates, many non-financial corporates are running into trouble with debt service,” the IIF added. Worldwide debt has risen to a record $226 trillion - more than three times global annual economic output - and firms in more countries are struggling to service loans, a study shows, just as key central banks prepare to end super-cheap credit policies.